June is a great month to explore the San Juans on your own private sailing charter aboard Diminuendo with Northwest Sailing Adventures. The scenery is always spectacular, but even more so in the spring, when the grasses are still green and the leaves on the trees are fresh and new. Abundant wildflowers splash the islands with color. 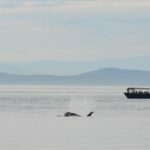 On Sunday, June 4th, we set sail from Bellingham and had a great day of sailing up to Sucia Island, where we anchored for the night in Fossil Bay. After a pleasant night in this snug harbor, we headed around the east side of the island to see if the Steller Sea Lions had returned. We were not disappointed! There were a number of the massive creatures basking on the rocks and more swimming nearby. As we neared the Saturna Lighthouse, we observed a cluster of boats near shore and decided to investigate. As we drew near, we saw the unmistakable plume of a whale blowing and caught a glimpse of black. 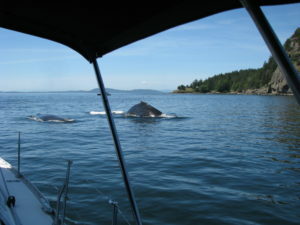 At first glance, Ron thought perhaps it was a Minke Whale which frequent the area, but on closer approach it became clear that it was a group of Humpbacks. We were following along at a distance while the whales and boats headed north for a bit. Then the whales abruptly turned directly our way. Ron could not determine which way to turn to stay clear of their path, so he stopped to let them pass. As they approached, we were struck by just how massive these creatures truly are. 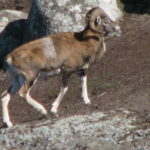 Whereas we usually see them from the side, seeing them from ahead gave us a view of their ample girth. They passed within about 20 feet of our starboard side, treating us to a close up view. The barnacles adorning the head of one were clearly visible. With a final wave of their tail flukes, they dove and disappeared below the surface, leaving us in awe. We then continued across Boundary Pass toward Turn Point. We saw another cluster of boats slowly moving along the eastern shore of Stuart Island toward the lighthouse. As we drew near, we saw the magnificent glistening black dorsal fin of a male orca, soon to be joined by the rest of the pod! 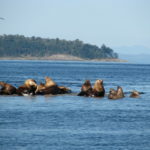 We followed as they rounded the point and proceeded into Haro Strait where they congregated for a time before heading off to the west. Later that evening as the sun sunk toward the horizon, Ron and Mari went for a paddle around Prevost Harbor in their kayaks, where they encountered a group of river otters. The following morning, we were treated to the sight of a herd of Mouflon Sheep congregating on the grassy slopes of Speiden Island. 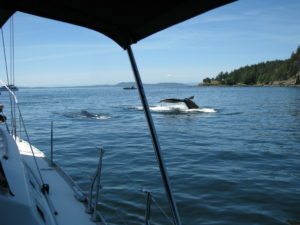 All in all this was a great cruise for wildlife encounters in the San Juan Islands.